Here are all the World Freshwater Championship winners since 1954. The late 1980's were successful years for Wales, winning a gold, a silver a bronze twice in the individual competitions and the team gold once. 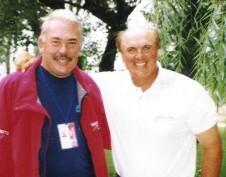 Below is a picture of me with the English champ Bob Nudd, who was crowned World no less than 4 times in the 1990's. Gold winning Brit's are Lane in 1963, Harris in 1969, Ian Heaps in 1975, David Thomas in 1981, Kevin Ashurst in 1982 (he had three silvers over the following years, losing to other Brit's Bob Nudd and myself), David Roper in 1985, myself in 1987 (after the silver in 1986), Tom Pickering in 1989, Bob Nudd who dominated in the early 1990's, and in recent years Alan Scotthorne, who won the title in 1996,97,98 and 2003, equalling the record of four championships that Bob Nudd achieved the year after Scotthorne won those three in a row! All are English apart from myself. Coming close with Silver are Stephan (for Scotland in 1984), Marks, Gardner and Raison (for England in 1976, 1988 and 2000 respectively). Only myself and Keven Ashurst of the British champions also won silver, none of us so far has won bronze. Bronze winners include Burch and Sherwood (for England in 1965 and 1968 respectively), Davis (for Wales in 1985), White (for England in 1987) and Bainton (for Wales in 1989, helping us win the Team Championship). The greatest foreign champion is the Frenchman Tesse who between 1956 and 1965 won 3 golds, 2 silvers and a bronze and is still ahead in overall wins. It is now reconised that Alan Scotthorn (England) is now the most successful Angler of all time with 5 Gold individual medals under his belt. Charleroi- Canal at Brussels Ronquières.